“The Birds” is Coming to Town: I’m already getting chills just thinking about it! Oh Boy! “The Birds” is Coming — thanks to NCM Fathom Events, Turner Classic Movies and Universal! On Wed, Sept 19, at 7PM — in celebration of Universal’s 100th Anniversary — The Birds will be shown at select theaters nationwide (see link below). 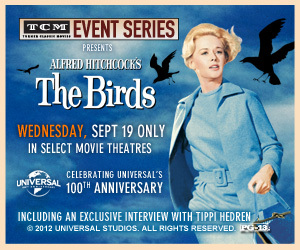 This movie event will begin with an exclusive TCM Robert Osbourne interview with Tippi Hedren. Hedren will reveal how this movie launched AND ended her career! The featurette will also include archival footage of Rod Taylor and Suzanne Pleshette sharing stories about the making of the film. This entry was posted in Fathom Events, Posts by Annmarie Gatti, TCM and tagged alfred hitchcock, Fathom Events, movie theater screenings, Rody Taylor, Suzanne Pleshette, TCM, the birds, tippi hedren, Universal Pictures. Bookmark the permalink. I remember the first time I watched ‘The Birds’ with my roommate. After it was over, she said she wasn’t impressed. Then, less than an hour later she comes over to me and asks me why the birds went nuts and attacked the people. I just smiled and told her that that was what made it scary, they never tell you so it could easily happen again. It drove her crazy for a few weeks. I also got to meet Tippi Hedren at Dragon*Con a few years ago. She was very sweet and lovely. I like that story! Personally I think Hitchcock is incredible! He knows how to keep me ‘on the edge of my seat’ without getting graphic or gory. And, I’m so glad to hear that Tippi Hedren was nice. Just wondering, what was she promoting at Dragon Con?? ?